Camille Pissarro (10 July 1830 – 13 November 1903) was a Danish-French Impressionist and Neo-Impressionist painter born on the island of St Thomas. His importance resides in his contributions to both Impressionism and Post-Impressionism. He studied from great forerunners, including Gustave Courbet and Jean-Baptiste-Camille Corot. He later studied and worked alongside Georges Seurat and Paul Signac when he took on the Neo-Impressionist style at the age of 54. 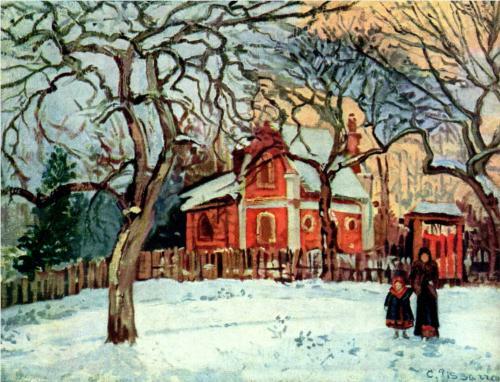 When Camille Pissarro was twelve his father sent him to boarding school in France. He studied at the Savary Academy in Passy near Paris. While a young student, he developed an early appreciation of the French art masters. Monsieur Savary himself gave him a strong grounding in drawing and painting and suggested he draw from nature when he returned to St. Thomas, which he did when he was seventeen. However, his father preferred he work in his business, giving him a job working as a cargo clerk. He took every opportunity during those next five years at the job to practice drawing during breaks and after work. When he turned twenty-one, Danish artist Fritz Melbye, then living on St. Thomas, inspired Camille to take on painting as a full-time profession, becoming his teacher and friend. Camille then chose to leave his family and job and live in Venezuela, where he and Melbye spent the next two years working as painting artists in Caracas. He drew everything he could, including landscapes, village scenes, and numerous sketches, enough to fill up multiple sketchbooks. In 1855 he moved back to Paris where he began working as assistant to Anton Melbye, Fritz Melbye's brother. In Paris, Camille worked as assistant to Danish painter Anton Melbye. He also studied paintings from other artists whose style impressed him: Courbet, Charles-François Daubigny, Jean-François Millet, and Corot. He also enrolled in various classes taught by masters, at schools such as École des Beaux-Arts and Académie Suisse. 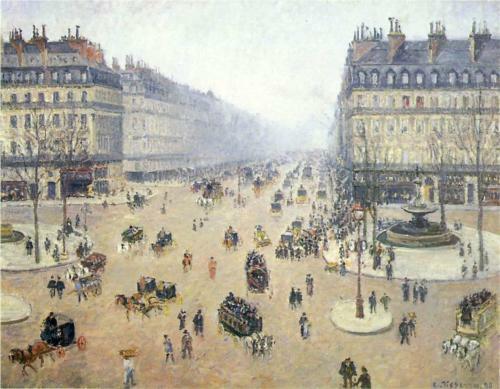 But Pissarro eventually found their teaching methods "stifling," states art historian John Rewald. This prompted him to search for alternative instruction, which he requested and received from Corot. In 1859 his first painting was accepted and exhibited. His other paintings during that period were influenced by Camille Corot, who tutored him. He and Corot both shared a love of rural scenes painted from nature. It was by Corot that Camille was inspired to paint outdoors, also called "plein air" painting. Pissarro found Corot, along with the work of Gustave Courbet, to be "statements of pictorial truth," writes Rewald. He discussed their work often. Jean-François Millet was another whose work he admired, especially his "sentimental renditions of rural life". "Rather than glorifying—consciously or not—the rugged existence of the peasants, he placed them without any 'pose' in their habitual surroundings, thus becoming an objective chronicler of one of the many facets of contemporary life." In later years, Cézanne also recalled this period and referred to Camille as "the first Impressionist". In 1906, a few years after Camille's death, Cézanne, then 67 and a role model for the new generation of artists, paid Camille a debt of gratitude by having himself listed in an exhibition catalogue as "Paul Cézanne, pupil of Camille". By the 1880s, Camille began to explore new themes and methods of painting to break out of what he felt was an artistic "mire". As a result, Pissarro went back to his earlier themes by painting the life of country people, which he had done in Venezuela in his youth. Degas described Pissarro's subjects as "peasants working to make a living". However, this period also marked the end of the Impressionist period due to Caille's leaving the movement. 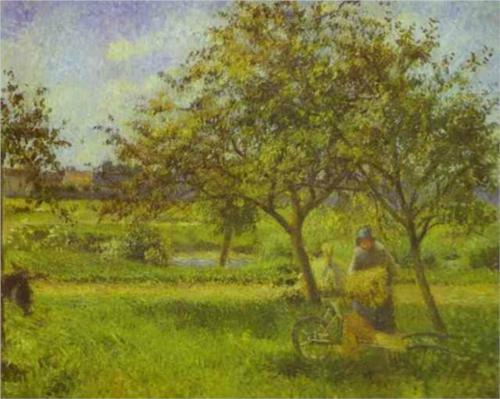 As Joachim Pissarro points out, "Once such a die-hard Impressionist as Pissarro had turned his back on Impressionism, it was apparent that Impressionism had no chance of surviving ..."
Tags: Camille Pissarro's Painting Style and Techniques, Camille Pissarro's Painting Skills.